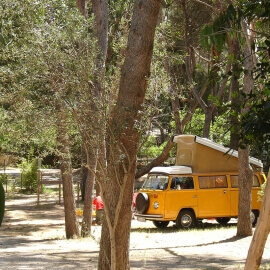 Near the port of La Madrague, the 3-star Olbia campsite in Hyères, spread over 1.5 ha, has 100 pitches in the shade of pine and eucalyptus trees, as well as an apartment on Presqu’île de Giens, for 4 people. 200 m from the campsite, the sea and beaches are reached through Parc des Chevaliers, a remarkable and classified pine forest and the wildest corner of the Presqu’île de Giens. At the western end of Presqu’île de Giens., in the heart of a century-old pine forest, Camping OLBIA also offers pitches for tents, caravans and motorhomes in a natural, authentic and unspoiled setting. Enjoy a protected environment with a minimarket, bar and restaurant on site. Since 2012, the toilet block is accessible for people with reduced mobility. No entertainment, just the song of cicadas lulls your days.